Geldy Kyarizov has earned the reputation of being the most knowledgeable person in the world on Akhal-Teke horses. The Akhal-Teke is one of the most ancient breeds, believed by the Turkoman people to be 5,000 years old. 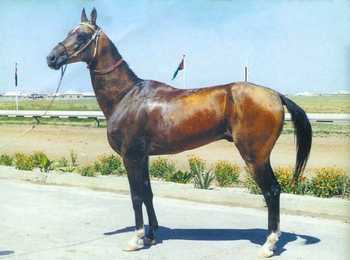 Under the Soviet rule of his homeland, Turkmenistan, Geldy saw the Akhal-Teke facing serious threat: the ancient traditions, based heavily around the pureblood, were being cast aside as the Russian masters showed no real interest in preserving the purity of the breed; indeed such was their contempt, the horses were used for meat. Geldy was not prepared to see such historical and magnificent animals lost for all time, and was determined to do all he could to reverse the decline. Over the years, he spent many hours at the Ashgabat hippodrome learning all he could, and travelled in the desert talking to the aksakals (the 'white beards'), the men who despite Soviet rule had maintained their ancient traditions and unparalleled horsemanship, handed down through generations over the centuries. He knew that without this knowledge, the pedigree of the Akhal-Teke would be gone forever. He also studied on a wider scale, for example recognising Akhal-Teke anatomy in the 2,500-year-old skeletons of ancient horses; and he recognised the importance of 18th Century Akhal-Teke influence in the English Thoroughbred. Geldy participated in, and organised, events to promote the Akhal-Teke to his countrymen, his government and the world. Notable amongst his many achievements were endurance rides to Moscow (4,300km in 1988) and into the Kara Kum desert (600km in 1989), and the Parade of Horses (2001) in which over a thousand Akhal-Tekes were paraded in Ashgabat before an international audience. Geldy was astute and foresaw the collapse of Soviet communism by several years. All stud farms had long been under state control when he moved out into the country and established the first private stud farm in Turkmenistan for decades. There he successfully concentrated on reversing the decline of the pureblood Akhal-Teke, and began developing relationships with horse breeders in Europe, the USA and around the world. Whilst the home of the Akhal-Teke would never be anything other than Central Asia, he was keen to see the breed established globally. Besides his private endeavours, he took a major role in state horse breeding activities, becoming General Director of Turkmen Atlary (the state equestrian organisation), and was presented with awards for his work. At the time of his arrest, Geldy had secured funding for a large equestrian complex in Ashgabat. 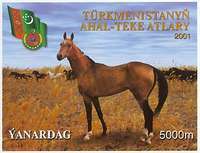 Just a few months previously, he had gifted to the President of Turkmenistan the champion stallion Yanardag (the name means " Volcano") whom he had bred. 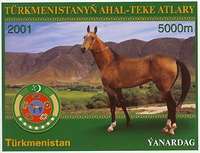 Yanardag now appears on the symbol of Turkmenistan and has appeared on the country's stamps. Today, Geldy and his family face destitution. For several years he languished in jail in poor health and in conditions which no-one should have to endure. His 'crime' was minor; but he was clearly not held for this. His incarceration was political - i.e. not because he had done anything wrong, but because someone didn't like his views or simply wanted him out of the way. Eventually, in 2008, he was released in the country's annual amnesty. His stud farm had been seized while he was in prison so he and his family found new land and started again but in March 2010 this land, too, was seized along with all of his horses. Geldy and his family members feel under constant threat and it's reported that they are now prohibited from working in Turkmenistan, and not permitted to leave the country. Geldy has much to offer his country and the horse-world in general: an unequalled knowledge and understanding of all aspects of the most enduring breed of horse ever known. See also Monica Bretherton's article on Geldy's work with Akhal-Tekes here.